Mandible fractures are a frequent injury because of the mandible's prominence and relative lack of support. As with any facial fracture, consideration must be given for the need of emergency treatment to secure the airway or to obtain hemostasis if necessary before initiating definitive treatment of the fracture. Major etiologic factors vary based on geographic location. Investigators in countries such as Jordan,  Singapore,  Nigeria,  ] ,[  New Zealand,  Denmark,  Greece,  Japan,  and Brazil  reported motor vehicle accidents to be the most common cause; in reports from other countries such as Greenland,  Finland,  Scotland,  Sweden,  Bulgaria,  and Canada  found assaults to be the most common etiology. 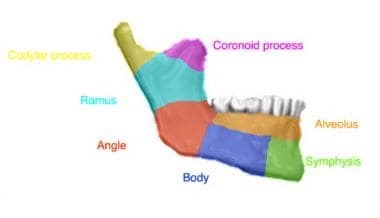 The anatomic regions of the mandible. Right sagittal mandibular body fracture and left parasymphysis fracture. Right mandibular body fracture. Left mandibular angle fracture going through tooth #17. Right mandibular ramus and left mandibular parasymphysis fractures. Mandibular sagittal symphysis fracture and dentoalveolar fracture. The effect of muscle action on the fracture fragments is important in classification of mandibular angle and body fractures. Angle fractures may be classified as (1) vertically favorable or unfavorable and (2) horizontally favorable or unfavorable. The muscles attached to the ramus (masseter, temporal, medial pterygoid) pull the proximal segment upward and medially and the symphysis of the mandible is displaced inferiorly and posteriorly by the pull of the digastric, geniohyoid, and genioglossus muscles. The muscular forces acting upon the mandible. 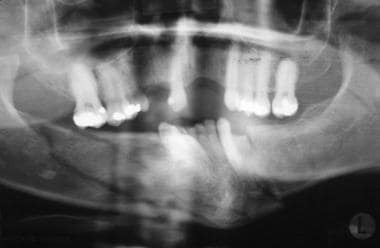 When the fractures are vertically and horizontally unfavorable, the fragments tend to be displaced. An "unfavorable" angle fracture with distracting muscular forces. Conversely, these same muscles tend to stabilize the bony fragments in horizontally and vertically favorable fractures. A "favorable" body fracture with muscular force not tending to distract the fracture. Type I is a fracture of the neck of the condyle with relatively slight displacement of the head. The angle between the head and the axis of the ramus varies from 10-45°. Type II fractures produce an angle from 45-90°, resulting in tearing of the medial portion of the joint capsule. Type III fractures are those in which the fragments are not in contact, and the head is displaced medially and forward. The fragments are confined within the area of the glenoid fossa. The capsule is torn, and the head is outside the capsule. Type IV fractures of the condylar head articulate on or in a forward position with regard to the articular eminence. Type V fractures consist of vertical or oblique fractures through the head of the condyle. A complete medical and psychiatric history is important for diagnosis and future treatment of mandible fractures. Thoroughly explore possible bleeding disorders, endocrine disorders,  or bony and collagenous disorders prior to surgery. History of previous mandibular trauma can help prevent misdiagnoses. Any pretraumatic temporomandibular joint dysfunction needs to be documented in detail prior to treatment. The source, size, and direction of traumatic force are helpful in diagnosis. Fractures sustained by a fist tend to have single, simple, or nondisplaced fractures whereas patients involved in motor vehicle accidents sustain compound comminuted fractures. Localized trauma (eg, pipe, stick, hammer) tends to cause a single comminuted fracture since the force is concentrated in a small area. Trauma distributed to a larger surface area may cause several fractures (eg, symphysis, condyle) secondary to distribution of the force throughout the mandible. Direction of the force can help in making the diagnosis of concomitant fractures. 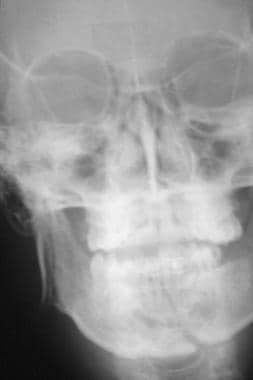 Trauma directed to the chin often results in a symphyseal fracture with concomitant unilateral or bilateral condylar fractures. Note facial lacerations, swellings, and hematomas. A common site for a laceration is under the chin, and this should alert the clinician to the possibility of an associated subcondylar or symphysis fracture. From behind the supine or seated patient, bimanually palpate the inferior border of the mandible from the symphysis to the angle on each side. Note areas of swelling, step deformity, or tenderness. Note areas of paresthesia, dysesthesia, or anesthesia along the distribution of the inferior alveolar nerve. 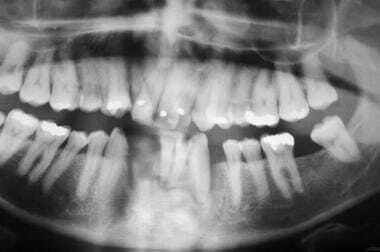 Numbness in this region is almost pathognomonic of a fracture distal to the mandibular foramen. Standing in front of the patient, palpate the movement of the condyle through the external auditory meatus. Pain elicited through palpation of the preauricular region should alert the clinician to a possible condylar fracture. Observe any deviation on opening of the mouth. Classically, deviation on opening is toward the side of the mandibular condyle fracture. Note any limited opening and trismus that may be a result of reflex muscle spasm, temporomandibular effusion, or mechanical obstruction to the coronoid process resulting from depression of the zygomatic bone or arch. Changes in occlusion are highly suggestive of a mandibular fracture. A change in occlusion may be due to a displaced fracture, fractured teeth and alveolus, or injury to the temporomandibular joint. Look for intraoral mucosal or gingival tears. Floor of the mouth ecchymosis may indicate a mandibular body or symphyseal fracture. 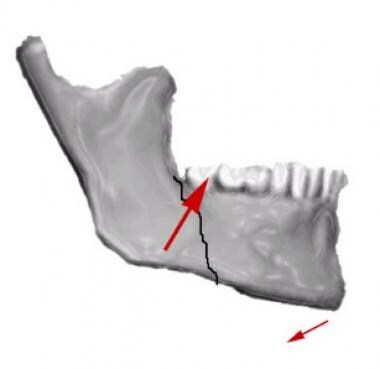 If a fracture site along the mandible is suggested, grasp the mandible on each side of the suspected site and gently manipulate it to assess mobility. Schmidt et al  and Shetty et al  performed financial analysis comparing patients treated with closed reduction and MMF with those treated with ORIF, and found, at least within the patient population at risk for mandible fractures, that the closed treatment was more cost-effective. Nondisplaced favorable fractures: Open reduction carries an increased risk of morbidity, thus use the simplest method to reduce and fixate the fracture. Grossly comminuted fractures: Generally, these are best treated by closed reduction to minimize stripping of the periosteum of small bone fragments. Fractures in children involving the developing dentition: Such fractures are difficult to manage by open reduction because of the possibility of damage to the tooth buds or partially erupted teeth. A special concern in children is trauma to the mandibular condyle. The condyle is the growth center of the mandible, and trauma to this area can retard growth and cause facial asymmetry. Early mobilization (7-10 d of intermaxillary fixation) of the condyle is important. If open reduction is necessary because of severe displacement of the fracture, the use of resorbable fixation or wires along the most inferior border of the mandible may be indicated. Coronoid fractures: These fractures usually require no treatment unless impingement on the zygomatic arch is present. Treatment of condylar fractures: This is one of the more controversial topics in maxillofacial trauma. Indications for open reduction are discussed below. If condylar fractures do not fall within this criteria, they can be treated with closed reduction for a period of 2-3 weeks to allow for initial fibrous union of the fracture segments. If the condylar fracture is in association with another fracture of the mandible, treat the noncondylar fracture with ORIF, and treat the condylar fracture with closed reduction. Condylar fractures: Although strong evidence supporting open reduction of condylar fractures is lacking, a specific group of individuals benefit from surgical intervention. The classic article by Zide and Kent lists absolute and relative indications for open reduction of the fractured mandibular condyle. Palmieri et al  and De Riu et al  demonstrated better long-term range of motion and occlusion in patients with condylar factures treated with ORIF versus closed reduction and MMF. Mandibular fracture. Coronal CT scan demonstrating bilateral high condylar fractures. The mandible is a U-shaped bone; the middle portion is termed the symphysis. The horizontal body of the mandible bears the tooth-bearing alveolar process. 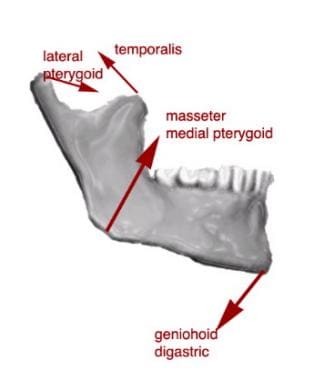 Distally, the horizontal body of the mandible joins the vertical ramus at the angle. The ramus has both the coronoid and condylar processes. The coronoid is the site of insertion for the temporalis muscle, while the condylar process articulates with the mandibular fossae of the temporal bone. Thoma KH. Historical review of methods advocated for treatment of jaw fractures with ten commandments for modern fracture treatment. Am J Orthodont Oral Surg. 1944. 30:399. Barton JR. A systemic bandage for fractures of the lower jaw. Am Med Recorder Phila. 1819. 2:153. Moon H. Mechanical appliances for treatment of fracture of the jaws. Br J Dent Sci. 1874. 17:303. Spiessl B. Rigid internal fixation of fractures of the lower jaw. Reconstr Surg Traumatol. 1972. 13:124-40. [Medline]. Cienfuegos R, Cornelius CP, Ellis 3rd E, Kushner G. CMF Mandible - Diagnosis - AO Surgery reference. AO Foundation. Available at http://www.aofoundation.org/wps/portal/. Accessed: Jan 31, 2008. Ellis E 3rd, Moos KF, el-Attar A. Ten years of mandibular fractures: an analysis of 2,137 cases. Oral Surg Oral Med Oral Pathol. 1985 Feb. 59(2):120-9. [Medline]. Champy M, Loddé JP, Schmitt R, Jaeger JH, Muster D. Mandibular osteosynthesis by miniature screwed plates via a buccal approach. J Maxillofac Surg. 1978 Feb. 6(1):14-21. [Medline]. Ellis E 3rd, Miles BA. 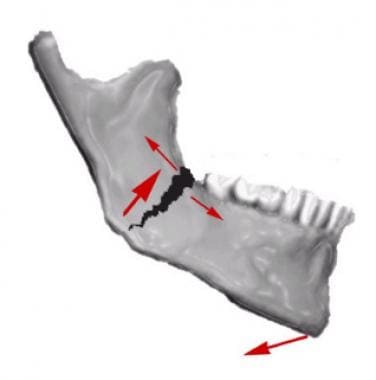 Fractures of the mandible: a technical perspective. Plast Reconstr Surg. 2007 Dec. 120(7 Suppl 2):76S-89S. [Medline]. Brook IM, Wood N. Aetiology and incidence of facial fractures in adults. Int J Oral Surg. 1983 Oct. 12(5):293-8. [Medline]. van Hoof RF, Merkx CA, Stekelenburg EC. The different patterns of fractures of the facial skeleton in four European countries. Int J Oral Surg. 1977 Feb. 6(1):3-11. [Medline]. Sojot AJ, Meisami T, Sandor GK, Clokie CM. The epidemiology of mandibular fractures treated at the Toronto general hospital: A review of 246 cases. J Can Dent Assoc. 2001 Dec. 67(11):640-4. [Medline]. Manson PN. Facial Fractures. Mathes SJ. Plastic Surgery. 2nd ed. Philadelphia: Saunders Elsevier; 2006. Vol. 3: Chapter 66, pp 77-380. [Full Text]. McDade AM, McNicol RD, Ward-Booth P, et al. The aetiology of maxillo-facial injuries, with special reference to the abuse of alcohol. Int J Oral Surg. 1982 Jun. 11(3):152-5. [Medline]. Bataineh AB. Etiology and incidence of maxillofacial fractures in the north of Jordan. Oral Surg Oral Med Oral Pathol Oral Radiol Endod. 1998 Jul. 86(1):31-5. [Medline]. Tay AG, Yeow VK, Tan BK, Sng K, Huang MH, Foo CL. A review of mandibular fractures in a craniomaxillofacial trauma centre. Ann Acad Med Singapore. 1999 Sep. 28(5):630-3. [Medline]. Adekeye EO. The pattern of fractures of the facial skeleton in Kaduna, Nigeria. A survey of 1,447 cases. Oral Surg Oral Med Oral Pathol. 1980 Jun. 49(6):491-5. [Medline]. Ugboko VI, Odusanya SA, Fagade OO. Maxillofacial fractures in a semi-urban Nigerian teaching hospital. A review of 442 cases. Int J Oral Maxillofac Surg. 1998 Aug. 27(4):286-9. [Medline]. Adams CD, Januszkiewcz JS, Judson J. Changing patterns of severe craniomaxillofacial trauma in Auckland over eight years. Aust N Z J Surg. 2000 Jun. 70(6):401-4. [Medline]. Marker P, Nielsen A, Bastian HL. Fractures of the mandibular condyle. Part 1: patterns of distribution of types and causes of fractures in 348 patients. Br J Oral Maxillofac Surg. 2000 Oct. 38(5):417-21. [Medline]. Zachariades N, Mezitis M, Mourouzis C, Papadakis D, Spanou A. Fractures of the mandibular condyle: a review of 466 cases. Literature review, reflections on treatment and proposals. J Craniomaxillofac Surg. 2006 Oct. 34(7):421-32. [Medline]. Tanaka N, Tomitsuka K, Shionoya K, Andou H, Kimijima Y, Tashiro T, et al. Aetiology of maxillofacial fracture. Br J Oral Maxillofac Surg. 1994 Feb. 32(1):19-23. [Medline]. Munante-Cardenas JL, Facchina Nunes PH, Passeri LA. Etiology, treatment, and complications of mandibular fractures. J Craniofac Surg. 2015 May. 26 (3):611-5. [Medline]. Thorn JJ, Mogeltoft M, Hansen PK. Incidence and aetiological pattern of jaw fractures in Greenland. Int J Oral Maxillofac Surg. 1986 Aug. 15(4):372-9. [Medline]. Oikarinen K, Ignatius E, Silvennoinen U. Treatment of mandibular fractures in the 1980s. J Craniomaxillofac Surg. 1993 Sep. 21(6):245-50. [Medline]. Adi M, Ogden GR, Chisholm DM. An analysis of mandibular fractures in Dundee, Scotland (1977 to 1985). Br J Oral Maxillofac Surg. 1990 Jun. 28(3):194-9. [Medline]. Strom C, Nordenram A, Fischer K. Jaw fractures in the County of Kopparberg and Stockholm 1979-1988. A retrospective comparative study of frequency and cause with special reference to assault. Swed Dent J. 1991. 15(6):285-9. [Medline]. Atanasov DT. A retrospective study of 3326 mandibular fractures in 2252 patients. Folia Med (Plovdiv). 2003. 45(2):38-42. [Medline]. Olson RA, Fonseca RJ, Zeitler DL, Osbon DB. Fractures of the mandible: a review of 580 cases. J Oral Maxillofac Surg. 1982 Jan. 40(1):23-8. [Medline]. Fridrich KL, Pena-Velasco G, Olson RAJ. Changing trends with mandibular fractures: A review of 1067 cases. J Oral Maxillofac Surg. 1985. 59:120. Afrooz PN, Bykowski MR, James IB, Daniali LN, Clavijo-Alvarez JA. The Epidemiology of Mandibular Fractures in the United States, Part 1: A Review of 13,142 Cases from the US National Trauma Data Bank. J Oral Maxillofac Surg. 2015 Dec. 73 (12):2361-6. [Medline]. Vaillant JM, Benoist M. Bullet wounds of the mandible in civil practice. Int J Oral Surg. 1981. 10(Suppl 1):255-9. [Medline]. Giovacchini F, Paradiso D, Bensi C, Belli S, Lomurno G, Tullio A. Association between third molar and mandibular angle fracture: A systematic review and meta-analysis. J Craniomaxillofac Surg. 2018 Apr. 46 (4):558-65. [Medline]. El-Anwar MW, Amer HS, Ahmed AF. Relation of Lower Last Molar Teeth With Mandibular Fractures. J Craniofac Surg. 2016 Oct. 27 (7):e713-6. [Medline]. Ward NH 3rd, Wainwright DJ. Outcomes research: mandibular fractures in the diabetic population. J Craniomaxillofac Surg. 2016 Jul. 44 (7):763-9. [Medline]. Lazow SK. The mandible fracture: a treatment protocol. J Craniomaxillofac Trauma. 1996. 2(2):24-30. [Medline]. Terris DJ, Lalakea ML, Tuffo KM, Shinn JB. Mandible fracture repair: specific indications for newer techniques. Otolaryngol Head Neck Surg. 1994 Dec. 111(6):751-7. [Medline]. Schneider M, Erasmus F, Gerlach KL, Kuhlisch E, Loukota RA, Rasse M. Open reduction and internal fixation versus closed treatment and mandibulomaxillary fixation of fractures of the mandibular condylar process: a randomized, prospective, multicenter study with special evaluation of fracture level. J Oral Maxillofac Surg. 2008 Dec. 66(12):2537-44. [Medline]. Sorel B. Open versus closed reduction of mandible fractures. Oral and Maxillofacial Surgery Clinics of North America. 1998. 10:553. Schmidt BL, Kearns G, Gordon N, Kaban LB. A financial analysis of maxillomandibular fixation versus rigid internal fixation for treatment of mandibular fractures. J Oral Maxillofac Surg. 2000 Nov. 58(11):1206-10; discussion 1210-1. [Medline]. Shetty V, Atchison K, Leathers R, Black E, Zigler C, Belin TR. Do the benefits of rigid internal fixation of mandible fractures justify the added costs? Results from a randomized controlled trial. J Oral Maxillofac Surg. 2008 Nov. 66(11):2203-12. [Medline]. Marshall MD, Buchbinder D. Pediatric mandibular injury. Facial Plast Surg. 1999 May. 7(2):195-203. Ferreira PC, Amarante JM, Silva PN, Rodrigues JM, Choupina MP, Silva AC, et al. Retrospective study of 1251 maxillofacial fractures in children and adolescents. Plast Reconstr Surg. 2005 May. 115(6):1500-8. [Medline]. Güven O, Keskin A. Remodelling following condylar fractures in children. J Craniomaxillofac Surg. 2001 Aug. 29(4):232-7. [Medline]. Valiati R, Ibrahim D, Abreu ME, Heitz C, de Oliveira RB, Pagnoncelli RM. 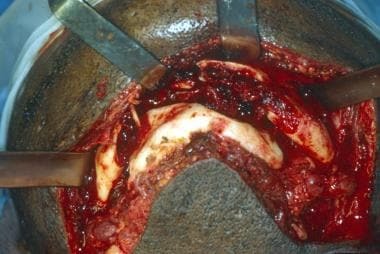 The treatment of condylar fractures: to open or not to open? A critical review of this controversy. Int J Med Sci. 2008. 5(6):313-8. [Medline]. Baker S, Betts NJ. Mandibular angle fractures. Oral and Maxillofacial Surgery Knowledge Update. 1998. 2:25. Palmieri C, Ellis E 3rd, Throckmorton G. Mandibular motion after closed and open treatment of unilateral mandibular condylar process fractures. J Oral Maxillofac Surg. 1999 Jul. 57(7):764-75; discussion 775-6. [Medline]. De Riu G, Gamba U, Anghinoni M, Sesenna E. A comparison of open and closed treatment of condylar fractures: a change in philosophy. Int J Oral Maxillofac Surg. 2001 Oct. 30(5):384-9. [Medline]. Ellis E 3rd, Palmieri C, Throckmorton G. Further displacement of condylar process fractures after closed treatment. J Oral Maxillofac Surg. 1999 Nov. 57(11):1307-16; discussion 1316-7. [Medline]. Adell R, Eriksson B, Nylen O, Ridell A. Delayed healing of fractures of the mandibular body. Int J Oral Maxillofac Surg. 1987 Feb. 16(1):15-24. [Medline]. Moore GF, Olson TS, Yonkers AJ. Complications of mandibular fractures: a retrospective review of 100 fractures in 56 patients. Nebr Med J. 1985 Apr. 70(4):120-3. [Medline]. Smith WP. Delayed miniplate osteosynthesis for mandibular fractures. Br J Oral Maxillofac Surg. 1991 Apr. 29(2):73-6. [Medline]. Tuovinen V, Nørholt SE, Sindet-Pedersen S, Jensen J. 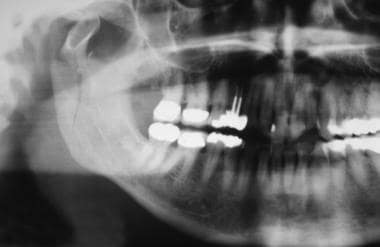 A retrospective analysis of 279 patients with isolated mandibular fractures treated with titanium miniplates. J Oral Maxillofac Surg. 1994 Sep. 52(9):931-5; discussion 935-6. [Medline]. Ellis E 3rd. Treatment methods for fractures of the mandibular angle. J Craniomaxillofac Trauma. 1996 Spring. 2(1):28-36. [Medline]. Biller JA, Pletcher SD, Goldberg AN, Murr AH. Complications and the time to repair of mandible fractures. Laryngoscope. 2005 May. 115(5):769-72. [Medline]. Webb LS, Makhijani S, Khanna M, Burstein MJ, Falk AN, Koumanis DJ. A comparison of outcomes between immediate and delayed repair of mandibular fractures. Can J Plast Surg. 2009. 17(4):124-6. [Medline]. Barker DA, Oo KK, Allak A, Park SS. Timing for repair of mandible fractures. Laryngoscope. 2011 Jun. 121(6):1160-3. [Medline]. Gunning TB. Treatment of fractures of the lower jaw by interdental splints. Br J Dent Sci. 1866. 9:481. Zallen RD, Curry JT. A study of antibiotic usage in compound mandibular fractures. J Oral Surg. 1975 Jun. 33(6):431-4. [Medline]. James RB, Fredrickson C, Kent JN. Prospective study of mandibular fractures. J Oral Surg. 1981 Apr. 39(4):275-81. [Medline]. Abubaker AO, Rollert MK. Postoperative antibiotic prophylaxis in mandibular fractures: A preliminary randomized, double-blind, and placebo-controlled clinical study. J Oral Maxillofac Surg. 2001 Dec. 59(12):1415-9. [Medline]. Miles BA, Potter JK, Ellis E 3rd. The efficacy of postoperative antibiotic regimens in the open treatment of mandibular fractures: a prospective randomized trial. J Oral Maxillofac Surg. 2006 Apr. 64(4):576-82. [Medline]. Theriot BA, Van Sickels JE, Triplett RG, Nishioka GJ. Intraosseous wire fixation versus rigid osseous fixation of mandibular fractures: a preliminary report. J Oral Maxillofac Surg. 1987 Jul. 45(7):577-82. [Medline]. Cienfuegos R, Cornelius CP, Ellis E III, Kushner G. AO - mandible surgery reference. AO Foundation. Available at http://www2.aofoundation.org/wps/portal/!ut/p/c1/04_SB8K8xLLM9MSSzPy8xBz9CP0os3hng7BARydDRwML1yBXAyMvYz8zEwNPQwN3A30_j_zcVP2CbEdFADw8CUE!/dl2/d1/L2dJQSEvUUt3QS9ZQnB3LzZfQzBWUUFCMUEwR0dSNTAySkowOFVIRzIwVDQ!/?segment=Mandible&bone=CMF&soloState=true&popu.... Accessed: 6/16/2011. Ellis E 3rd. Lag screw fixation of mandibular fractures. J Craniomaxillofac Trauma. 1997 Spring. 3(1):16-26. [Medline]. Ellis E 3rd. Management of fractures through the angle of the mandible. Oral Maxillofac Surg Clin North Am. 2009 May. 21(2):163-74. [Medline]. Singh V, Puri P, Arya S, Malik S, Bhagol A. Conventional versus 3-Dimensional Miniplate in Management of Mandibular Fracture: A Prospective Randomized Study. Otolaryngol Head Neck Surg. 2012 May 30. [Medline]. Negreiros Lyrio MC, Monnazzi MS, De Moraes M, Hochuli-Vieira E, Nunes Reis JM, Pereira-Filho VA. Comparison of compressive strength between three different plates for mandibular angle fractures fixation. J Craniomaxillofac Surg. 2013 Nov 1. [Medline]. Darwich MA, Albogha MH, Abdelmajeed A, Darwich K. Assessment of the Biomechanical Performance of 5 Plating Techniques in Fixation of Mandibular Subcondylar Fracture Using Finite Element Analysis. J Oral Maxillofac Surg. 2015 Nov 24. [Medline]. Goyal M, Jhamb A, Chawla S, Marya K, Dua JS, Yadav S. A Comparative Evaluation of Fixation Techniques in Anterior Mandibular Fractures Using 2.0 mm Monocortical Titanium Miniplates Versus 2.4 mm Cortical Titanium Lag Screws. J Maxillofac Oral Surg. 2012 Dec. 11(4):442-50. [Medline]. [Full Text]. Ellis 3rd E, Zide MF. Transoral Approaches to the Facial Skeleton. Ellis 3rd E, Zide MF. Surgical Approaches to the Facial Skeleton. 2nd ed. Philadelphia: Lippincott Williams & Wilkins; 2005. Section 4, pp 109-150. Risdon F. Ankylosis of the temporomandibular joint. J Am Dent Assoc. 1934. 21:1933. Ellis 3rd E, Zide MF. Transfacial Approaches to the Mandible. Ellis 3rd E, Zide MF. Surgical Approaches to the Facial Skeleton. 2nd ed. Philadelphia: Lippincott Williams & Wilkins; 2005. Section 5. pp 151-189. Dingman RO, Grabb WC. Surgical anatomy of the mandibular ramus of the facial nerve based on the dissection of 100 facial halves. Plast Reconstr Surg Transplant Bull. 1962 Mar. 29:266-72. [Medline]. Hinds EC. Correction of prognathism by subcondylar osteotomy. J Oral Surg (Chic). 1958 May. 16(3):209-14. [Medline]. Hinds EC, Girotti WJ. Vertical subcondylar osteotomy: a reappraisal. Oral Surg Oral Med Oral Pathol. 1967 Aug. 24(2):164-70. [Medline]. Devlin MF, Hislop WS, Carton AT. Open reduction and internal fixation of fractured mandibular condyles by a retromandibular approach: surgical morbidity and informed consent. Br J Oral Maxillofac Surg. 2002 Feb. 40(1):23-5. [Medline]. Mohan AP, Jeevan Kumar KA, Venkatesh V, Pavan Kumar B, Patil K. Comparison of preauricular approach versus retromandibular approach in management of condylar fractures. J Maxillofac Oral Surg. 2012 Dec. 11(4):435-41. [Medline]. [Full Text]. Kempers KG, Quinn PD, Silverstein K. Surgical approaches to mandibular condylar fractures: a review. J Craniomaxillofac Trauma. 1999 Winter. 5(4):25-30. [Medline]. Thoma KH. Treatment of condylar fractures. J Oral Surg (Chic). 1954 Apr. 12(2):112-20. [Medline]. Rowe NL. Surgery of the temporomandibular joint. Proc R Soc Med. 1972 Apr. 65(4):383-8. [Medline]. Neal DC, Wagner WF, Alpert B. Morbidity associated with teeth in the line of mandibular fractures. J Oral Surg. 1978 Nov. 36(11):859-62. [Medline]. de Amaratunga NA. The effect of teeth in the line of mandibular fractures on healing. J Oral Maxillofac Surg. 1987 Apr. 45(4):312-4. [Medline]. Shetty V, Freymiller E. Teeth in the line of fracture: a review. J Oral Maxillofac Surg. 1989 Dec. 47(12):1303-6. [Medline]. Zavlin D, Jubbal KT, Echo A, Izaddoost SA, Friedman JD, Olorunnipa O. Multi-institutional Analysis of Surgical Management and Outcomes of Mandibular Fracture Repair in Adults. Craniomaxillofac Trauma Reconstr. 2018 Mar. 11 (1):41-8. [Medline]. Ostrander BT, Wang HD, Cusano A, Manson PN, Nam AJ, Dorafshar AH. Contemporary Management of Mandibular Fracture Nonunion-A Retrospective Review and Treatment Algorithm. J Oral Maxillofac Surg. 2018 Feb 6. [Medline]. Li Z, Zhou Z, Li P, Zeng W, Qing H, Tang W. Retrospective Study on Multidrug-Resistant Bacterium Infections After Rigid Internal Fixation of Mandibular Fracture. J Oral Maxillofac Surg. 2015 Nov 6. [Medline]. Borah GL, Ashmead D. The fate of teeth transfixed by osteosynthesis screws. Plast Reconstr Surg. 1996 Apr. 97(4):726-9. [Medline]. Thorén H, Iso-Kungas P, Iizuka T, Lindqvist C, Törnwall J. Changing trends in causes and patterns of facial fractures in children. Oral Surg Oral Med Oral Pathol Oral Radiol Endod. 2008 Oct 27. [Medline]. Chen CT, Lai JP, Tung TC, Chen YR. Endoscopically assisted mandibular subcondylar fracture repair. Plast Reconstr Surg. 1999 Jan. 103(1):60-5. [Medline]. Lee C, Forrest CR. Endoscopic facial fracture management: techniques. Mathes SJ. Plastic Surgery. 2nd ed. Philadelphia: Saunders Elsevier; 2006. Vol. 3: Chapter 68, 463-4579. [Full Text]. Martin M, Lee C. Endoscopic mandibular condyle fracture repair. Atlas Oral Maxillofac Surg Clin North Am. 2003 Sep. 11(2):169-78. [Medline]. Zhou H, Lv K, Yang R, Li Z, Li Z. Mechanics in the Production of Mandibular Fractures: A Clinical, Retrospective Case-Control Study. PLoS One. 2016. 11 (2):e0149553. [Medline]. [Full Text]. Nabil Y. Evaluation of the effect of different mandibular fractures on the temporomandibular joint using magnetic resonance imaging: five years of follow-up. Int J Oral Maxillofac Surg. 2016 Nov. 45 (11):1495-9. [Medline]. Retromandibular approach to right mandibular condylar fracture. Intraoperative view. Fixation of right mandibular condyle fracture. Mandibular fracture. Close-up view of postoperative pantomogram. Mandibular fracture. Postoperative coronal image demonstrating open reduction internal fixation of the left condylar fracture to restore posterior vertical height. Mandibular fracture. Intraoperative view. Reconstruction plate used to span continuity defect of right mandibular body. Mandibular fracture. Autologous bone harvested from the patient's anterior iliac crest placed into defect. Mandibular fracture treated with lag screw fixation and debridement of dentoalveolar segment. Mandibular fracture. Patient lost to follow-up at local county jail presents with infected nonunion of mandibular symphysis. Mandibular fracture. Infection treated with incision and drainage and intravenous antibiotics. Hardware was removed and site debrided. Postoperative posteroanterior cephalometric view demonstrating reconstruction plate in place. Mandibular fracture treated with 4-hole positional plate and maxillomandibular fixation. Axial CT scan demonstrating multiple fractures of the mandible. Axial CT scan demonstrating severe displacement. Mandibular fracture. Intraoperative view demonstrating fixation of mandibular segments. Mandibular fracture. Left lateral view. Mandibular fracture. Right lateral view. Mandibular fracture. 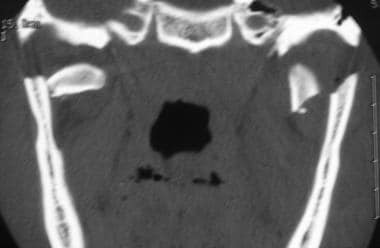 Axial CT scan demonstrating status post fixation. Mandibular fracture. Pantomogram status post fixation. Mandibular fracture. Postoperative posteroanterior cephalometric view. Mandibular fracture. The right side was treated with 3 positional screws to engage buccal and lingual cortices of sagittal fracture. The right side is rigidly fixated with a 6-hole plate. Right mandibular body and left mandibular angle fractures status post fixation. Tooth #17 was extracted. Mandibular fracture. Interarch elastics may be used for maxillomandibular fixation. They also may be used loosely for guidance during postoperative care. Left mandibular angle fracture involving tooth #17. Right mandibular body fracture. Tooth #17 was extracted. A superior border plate was placed at the left mandibular angle. 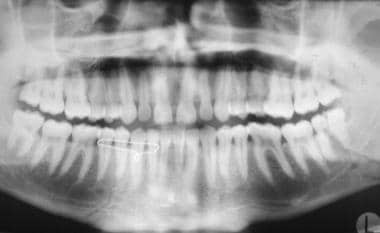 An inferior border plate was placed for the right mandibular body fracture. Mandibular fracture. Patient presents with occlusal step off between right mandibular central and lateral incisors. Mandibular fracture. View of occlusal step off. Mandibular fracture. Bridle wire used to decrease mobility and provide patient comfort. Mandibular fracture. Barton bandage used to decrease fracture mobility and provide patient comfort until definitive treatment. Mandibular fracture. Open reduction rigid internal fixation of left mandibular body fracture. Mandibular fracture. Postoperative radiograph demonstrating reduction and fixation. Mandibular fracture. Patient with poorly controlled type 1 diabetes with left open, complete, moderately displaced mandibular angle fracture between teeth #17 and #18. Mandibular fracture. Treated initially with a superior border plate and an inferior border plate as well as extraction of tooth #17. Mandibular fracture. 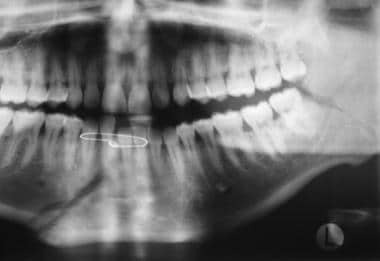 Patient returns with infected nonunion of left mandibular angle and loose hardware. The superior border plate was removed. Tooth #18 was extracted. The patient was treated with intravenous and oral antibiotics. Mandibular fracture. Rigid fixation with an 8-hole plate. Two holes in the center are used to span the fracture site. The authors and editors of Medscape Reference gratefully acknowledge the contributions of previous authors Robert David Nesbit, MD; Adel R Tawfilis, DDS; David W Kim, MD; and Patrick Byrne, MD to the development and writing of this article.